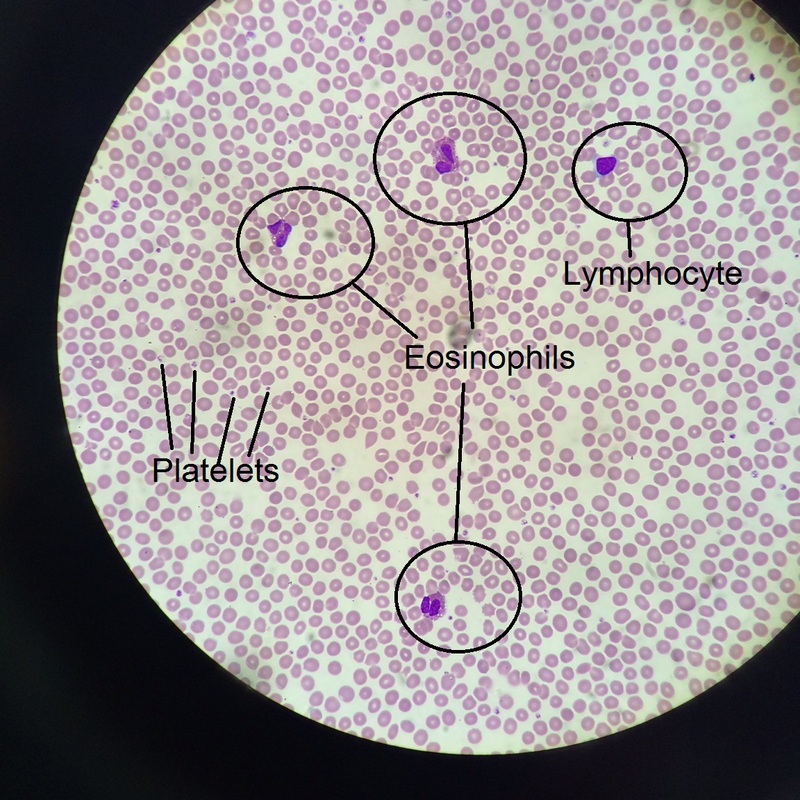 This case highlighted the investigation of a patient with eosinophilia. Eosinophilia can occur in 1-1.5% of blood counts in the UK. Eosinophils develop in the bone marrow and IL-3, IL-5 and GM-CSF are essential for their differentiation. Sometimes solid tumours can secrete these cytokines causing eosinophilia. Eosinophils are involved with host defence against parasites, as modulators of innate and adaptive immunity, inflammatory responses and tissue repair, and affect mast cell activation and T-cell function. There is no concrete evidence base to guide the best way to monitor or investigate patients with eosinophilia. Most bodies make decisions based on opinion. The British Committee for standards in haematology is writing a guideline currently on this topic. However if a patient is found to have eosinophilia it is important to undertake a history and examination. The history should be focused on identifying a cause based on the list above. It is important to ask about any new medications, travel and allergic symptoms. This will reveal most causes. If no symptoms are obvious then a systemic enquiry asking about ‘red flag’ symptoms (weight loss, sweats, blood loss, anorexia etc.) is required. An examination is useful to clarify points from the history and also document any enlargement of spleen and liver which may be asymptommatic. It is also useful to document examination findings to allow for assessment of changes. If the eosinophilia is mild (generally <1.5×109/L) and there is an obvious cause many may not feel the need to repeat, but appropriate safety netting is required. If there is no obvious cause on initial evaluation, or the patient has evidence of end organ damage (heart failure, respiratory symptoms, diarrhoea, rash) or the eosinophil count is >1.5×109/L then further evaluation and repeating is generally required. Generally it would be unusual for an allergic cause for the eosinophil count to be >2×109/L. The history was generally rather vague (as is often the case!). The eosinophil count was high, but not overtly and the patient had a history of ‘asthma’ but certainly wasn’t active as he hadn’t used his inhalers for years. He also had the ‘sniffles’ which may have been interpreted as a viral illness or hay fever. There were no other pointers and the patient was not unwell and had a normal chest and abdominal examination. It was agreed to repeat the full blood count at a timely interval to ensure all was resolving. Unfortunately he did not attend follow up and re-presented with symptoms of cardiac failure and a significantly elevated eosinophil count. Blood films are able to detect abnormal lymphocytes (possible lymphoma), primative cells or dysplastic features (possible leukaemia or myelodysplasia), certain parasites (filariasis etc. 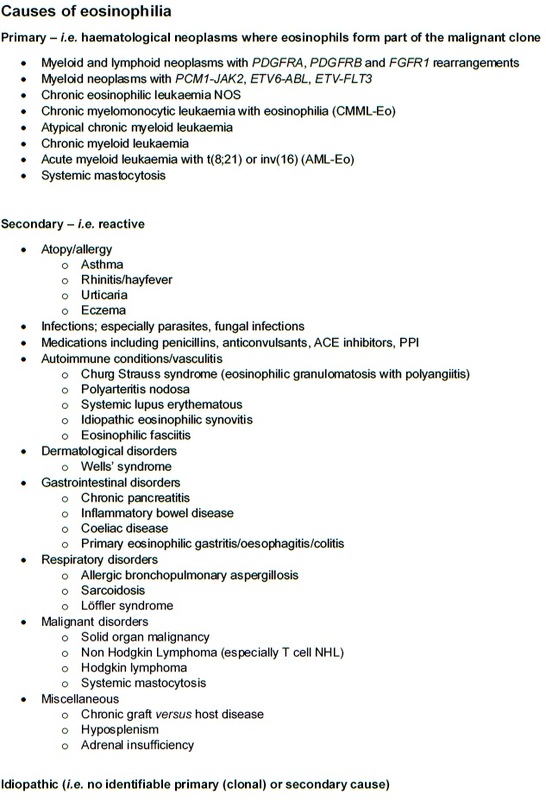 ), marrow infiltration or proliferative disorders (leucoerythroblastic features), hyposplenism (Howell Jolly bodies). However the morphology of the eosinophils is often not helpful as reactive and malignant disorders can both have normal and abnormal features. The classification of primary eosinophillic disorders is difficult with a number of different versions in use. In general the disorders are classified according to molecular/genetic markers. For those where clonality cannot be proven the term ‘hyper-eosinophillic syndrome’ is used (diagnosis of exclusion). It may be that there is a clonal/malignant disorder here but it cannot be proven. It may also be that there is a reactive disorder which is yet to make itself known. Myeloid and lymphoid neoplasms with eosinophilia and abnormalities of PDGFRA, PDGFRB or FGFR1 are classified under a different heading as although these mutations result in a ‘chronic eosinophillic leukaemia picture’ they can also result in AML or T cell lymphoblastic lymphoma. He had a full work up looking for various secondary disorders including ANA, ANCA and DsDNA all of which were negative. Due to being symptommatic with evidence of cardiac dysfunction molecular analysis is sent looking for clonal eosinophillic disorders and the FIP1L1-PDGFRA fusion gene was found. Marrow biopsy shows a hypercellular marrow – mostly consisting of mature eosinophils. No excess of myeloid or lymphoid blasts and immunohistochemistry did not reveal any evidence of lymphoma. There was grade 3 reticulin fibrosis. He was commenced on steroids initially (as this would treat both vasculitic and haematological causes) and then once FIP1L1-PDGFRA was confirmed he was given imatinib 100mg od PO. A week later the eosinophilia had disappeared and six months later there was no evidence of FIP1L1-PDGFRA. This is a rare myeloproliferative neoplasm. Due to the difficulty and changing classification of the disorder it is difficult to give an incidence but is likely to be at 0.036 in 100 000 person years. It can cause cardio-respiratory damage due to tissue infiltration by eosinophils. End organ damage occurs as a result of eosinophil degranulation and release of cytokines along with an inflammatory response. The FIP1L1-PDGFRA fusion gene is the most common abnormality and arises from an 800-kb interstitial deletion, del(4)(q12q12), that leads to constitutive activation of PDGFRA. Most patients will have a normal karyotype so FISH or PCR is required to detect the abnormality. Most patients with FIP1L1-PDGFRA are male (cause unclear). There are numerous other molecular abnomalities and this will govern the classification and therefore treatment of the disease. Some conditions such as those associated with PDGFRA/B are extremely sensitive to the tyrosine kinase inhibitor, imatinib. Where imatinib does not work or a mutation cannot be found mepolizumab – a monoclonal antibody targetting IL-5 can be trialed. Other options include hydroxycarbamide, vinca alkaloids, ciclosporin and interferon. This entry was posted in Laboratory morphology, Myeloproliferative neoplasm, Related to other specialities and tagged Eosinophilia. Bookmark the permalink.